Garlock mezzanine safety gates offer innovative load and unload fall protection with cantilever, overhead roller and rack bay roller safety gates. These gates help protect workers from the risk of falls while working with elevated loads. Three-sided protection against falls from raised platforms with mezzanine safety gates that block access to the edge while goods are being loaded or unloaded. Protective cages keep workers safely away from platform edges. Protect workers on the mezzanine edge with spring loaded swing arms that allow loading of goods but won't allow workers to fall off. Arms swing inward to allow loading and return to their safety position as the pallet is removed. Whether choosing the pivot or the overhead roller gate, workers will be safer from falls. These gates put an enclosure at the edge when workers lift the inward gate to access loads. 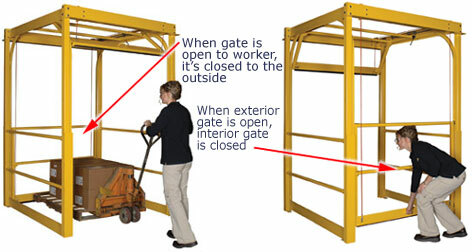 When inward gates are closed, the edge gate opens for forklift access. Safely move pallets, skids, containers and other loads on and off your mezzanine with a mezzanine safety gate. 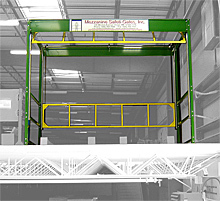 It works with almost any mezzanine, including new platforms or a mezzanine already installed in your facility. It is easy to install and use, providing a system where it is nearly impossible for a worker to enter the gate when a pallet is being loaded or unloaded.